Please post a question and the code you have tried. the main element should have two paragraph elements as children. Question: The main element should have two paragraph elements as children. 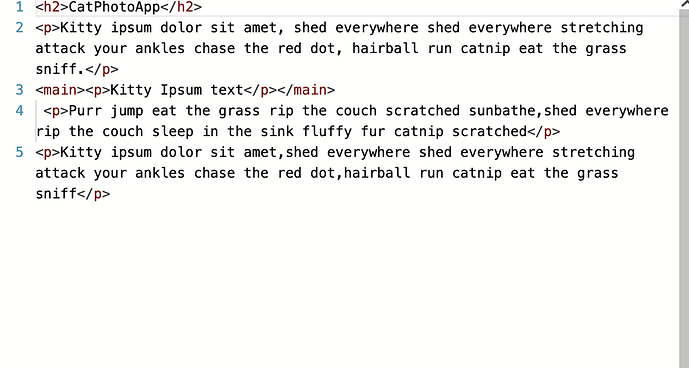 Question: Create a second p element after the existing p element with the following kitty ipsum text:Purr jump eat the grass rip the couch scratched sunbathe, shed everywhere rip the couch sleep in the sink fluffy fur catnip scratched. You have to reset the code and add a second <p></p> element with the above Purr text and wrap the two paragraph elements inside the element.